Supreme Court Justice Brett Kavanaugh delivered his first opinion for the high court Tuesday in a case concerning the Federal Arbitration Act. In recent years the Supreme Court has adopted a pro-arbitration bent. Arbitration is a dispute resolution process that takes place outside courts. Advocates…. As a result of Trump’s shutdown, 800,000 federal employees are in danger of not receiving a paycheck. They’re worried about how they’ll pay their mortgages, feed their families and put gas in their cars. In spite of all of these consequences, Republican leader Mitch McConnell refuses to take action. We should block consideration of all bills on the Senate floor until we end the Trump shut down and reopen the federal government. One Louisiana contractor is worried he could lose his apartment. Do you like this move? If California really respected the law, this police corporal’s alleged killer might not have been in the country at all. Where’s he been the past few years? Far too many people still do not know about HR 1. This is a call to action to our followers: Share this video with your friends and family. Let’s get the word out! Do you know about HR 1? This is a monumental victory, not just for voting rights, but for criminal justice reform. If we want a criminal justice system that rehabilitates people, we need to make sure formerly incarcerated people can fully participate as citizens. We must finally end our oppressive, undemocratic status quo and re-enfranchise millions of voters in this country. It was an emotional morning in the Sunshine State, as people with felony convictions were able to register to vote for the first time. Americans are standing up against constitutional attacks. Gun owners in a Colorado city that passed a strict ‚assault weapons‘ ban have refused to comply with an order to certify their firearms with the city. Some have suggested a barrier is immoral… The only thing that is immoral is the politicians to do NOTHING and continue to allow more innocent people to be so horribly victimized. This should have been airing non-stop before and after Trump’s address. It’s too good to not get it in front of the entire country. Trump just riled up Democrats with a big changeup in regard to the border wall. 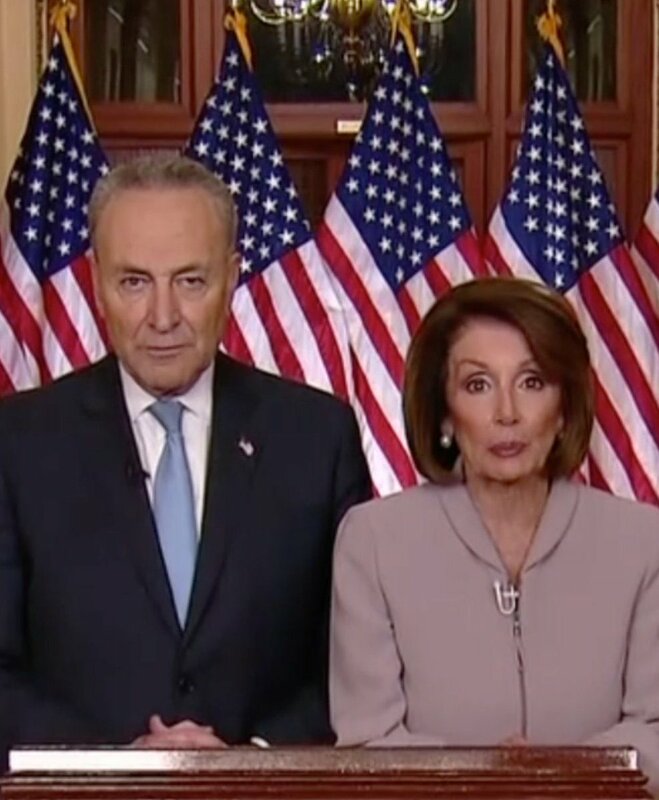 President Trump let Democrats know that a new material other than concrete would be used to construct a wall on the southern border. No wonder Speaker Pelosi didn’t seem pleased. President Donald Trump slammed House Speaker Nancy Pelosi during Tuesday night’s Oval Office address. To my mind, there is no greater disservice to millions of veterans throughout this country than to deny them the health care they have earned by draining the VA of its resources in order to line the pockets of corporate CEOs and shareholders. If President Trump thinks privatizing the VA is what is best for our veterans, he is dead wrong. An analysis of VA claims data shows that sending more vets to private care has not had the positive effects that were long promised by conservatives. @senjudiciary In addition, I will also continue to seek common ground on the major issue facings our nation. We are just not a direct democracy—and I don’t know anyone who ever said that we are (and I’d be happy to join with anyone to argue we should not be). Donald Trump is facing reality. Nancy Pelosi … isn’t. I’m honored to be selected as Chairman of @senjudiciary. Today’s Commentary — President Trump’s Speech — Most tasteless tweet — The dumbest attempt at pious superiority — Democrat mega donor in trouble — Ainsworth: „Get woke, go broke“ — fashion magazines leaving newsstands — AOC trashes the fact-checkers — A big-week for believers in socialism…. Senator Ted Cruz has a new idea for border security … a bill that builds the wall and makes El Chapo pay for it! RT @theprospergroup: Senator @tedcruz has a new idea for border security … a bill that builds the wall and makes El Chapo pay for it! Our federal employees deserve to be treated with respect, not held hostage as political pawns. One of the most shameful parts of this administration has been its efforts to reduce the federal government’s role in promoting civil rights regulations. We must remember that the struggle for civil rights is not the struggle of a day, or a year, or a generation. It is the struggle of a lifetime, and one that must be fought by every generation. A recent Washington Post report says plans to alter disparate impact regulation, a key part of civil rights enforcement, might be in the works. The Border Wall would very quickly PAY FOR ITSELF. The cost of illegal drugs exceeds $500 billion dollars a year – vastly more than the $5.7 billion dollars we have requested from Congress. Everyone deserves the right to vote. Congrats Florida! Ex-felons in Florida can finally register to vote. 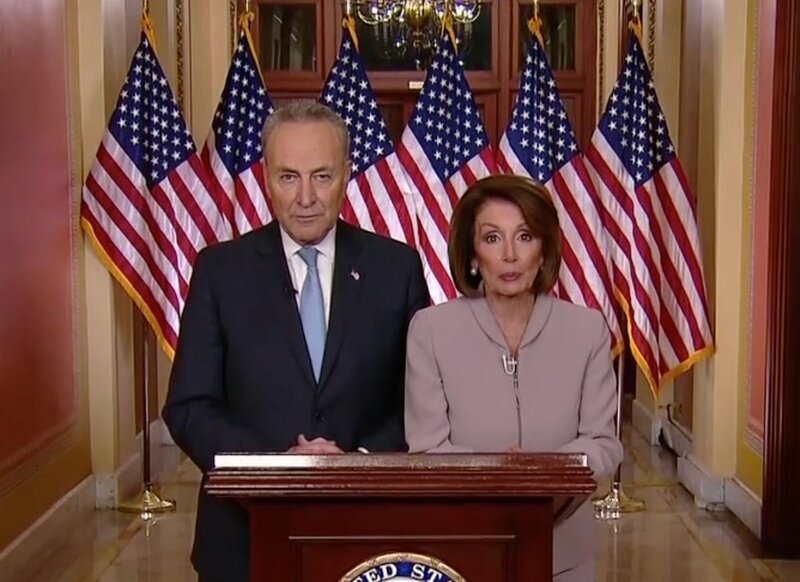 I hope you watched President Trump’s brief address last night on border security, and Nancy Pelosi and Chuck Schumer’s response. As I have said for years, climate change is the greatest threat facing our country and the planet. The Trump administration’s refusal to acknowledge this reality, let alone address it, is an ugly betrayal of our children and the future generations who will have to inhabit an increasingly uninhabitable planet. We must come together to take on the greed of the fossil fuel industry, who consider their short-term profits more important than the kind of lives our grandchildren will have. The nation is now far off course from what the Obama administration promised under the Paris agreement, leaving a big gap for the rest of the world to make up. Helen Smith at Instapundit has an essay that gets me as happy as the thought of a high border wall. We have got to end the private prison racket in America. Private corporations should not be making profits off of the incarceration of human beings. The American people want comprehensive immigration reform and a criminal justice system that is based on justice, not racism or mass incarceration. A surging inmate population in the 1980s led to a boom in for-profit prisons. Today, privately run prisons have become the government’s default detention centers for undocumented migrants. It’s pretty clear: Exxon knew about climate change and intentionally misled the public. Why? To protect their profits at the expense of the planet. The greed of fossil fuel companies is destroying our planet. It has got to end. Massachusetts wants to know what the oil giant knew about climate change. Jon Kyl returned to his lobbying firm Covington & Burling a week after ending his brief tenure as a U.S. senator from Arizona. 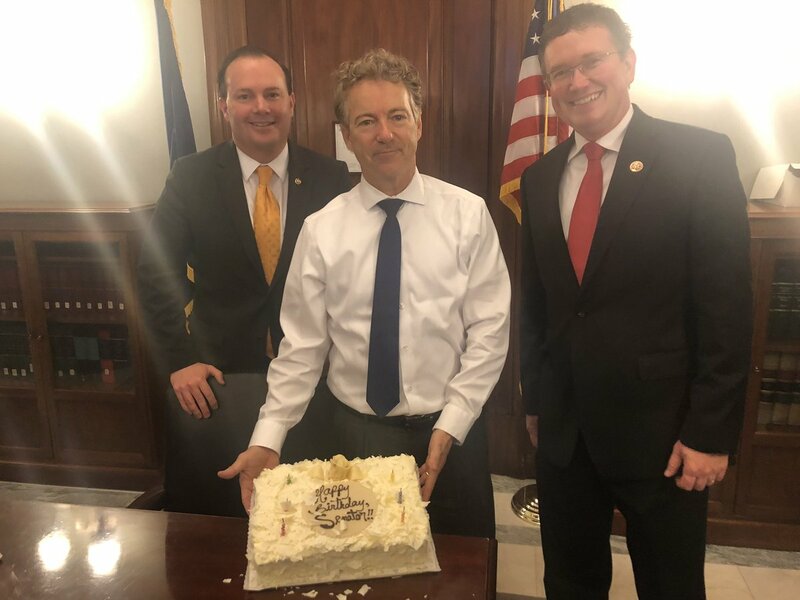 I had a surprise visit by some friends today at my office to celebrate my birthday. Over the past 40 years, the wealthiest and most powerful people in this country have rigged the economy against the American middle class, the working class and the most vulnerable people among us. The very rich are getting richer while most working families are struggling.We must create an economy based on human needs, not the greed of the billionaire class. The line between consumers and shareholders has blurred in recent decades. But the profits still tend to flow upward. We’ve raised over $100k and counting for organizations that help families and kids at the border since the beginning of the president’s TV stunt last night. 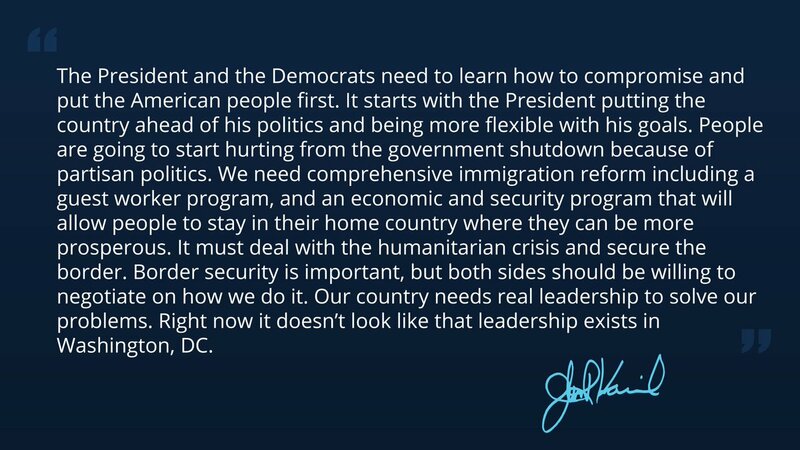 I have tried to be reasonable and practical when it comes to immigration but I’m flabbergasted to hear from my Democratic colleagues — who have voted for billions of dollars in border security money — that this is a manufactured crisis. Was it manufactured when Obama wanted the money? No. Why did you give the money to Obama and Bush if it was a manufactured crisis? Lindsey Graham’s Pitch for the Wall – Cortney O’Brien: Sen. Lindsey Graham (R-SC) hears the complaints about a border .01/09/2019 10:11:50AM EST. First, Trump shut down the government. Then, his administration started looking into what effect it would have. They did not realize that 38 million Americans will lose their food stamps under a shutdown, nor did they know that thousands of tenants would face eviction without assistance from the Department of Housing and Urban Development. The Trump administration’s shutdown was planned about as well as everything else Trump has done. Last summer, a federal judicial panel found that lawmakers had racially gerrymandered 11 districts. The babble of some people is like sword thrusts, but the tongue of the wise is healing. This is a choice between right and wrong. Justice and injustice. Was this a Democrat response or a hostage tape? Sen. Marco Rubio called out freshman Rep. Rashida Tlaib for her use of ‚anti-Semitic‘ rhetoric and her support for the BDS movement. RT @HillaryClinton: Want to fight back against Trump’s ridiculous address tonight? Once again, the Dems are doing all they can to throw Bernie Sanders under the bus. The editorial board of a major newspaper in Vermont just published a column urging Sen. Bernie Sanders against making another run for the presidency. RT @elianayjohnson: . @LindseyGrahamSC tells @seanhannity this is the „most presidential“ he’s seen President Trump. The President needs to put the country ahead of politics. Speaking with @foxnews @seanhannity in just a few minutes. After President @realDonaldTrump’s address to the nation tonight at 9:00 pm I will be speaking with @foxnews @seanhannity. Fortunately, a Republican Senate stands in their way. Want to fight back against Trump’s ridiculous address tonight? Send some support to organizations that help kids at the border. The only border crisis we’re facing is the inhumane detention of kids that has already led to the deaths of two children. Two children have died in U.S. custody at the border. Let’s not stop at feeling heartbroken. Let’s mobilize to help. This isn’t the time to play politics. It’s time to work together in order to create policy that reflects the urgency of our current situation. I stand with the vast majority of the American people in the shared fight for safer gun laws and against the NRA’s corporate influence and ability to buy candidates and elected officials. Three men were fatally shot and four were injured late Friday at a Torrance bowling alley, police said, and relatives and friends wept and shouted outside as they awaited word on the victims.